Empires of light : Edison, Tesla, Westinghouse, and the race to electrify the world. · One Book. One Author. One Hour. Notes on front endpapers: "Edison's obstinate opposition to AC [alternate current]. -- Volts, Amps, Ohms; Michael Faraday. - Burnt Morgan library; William Vanderbuit - small fire. - Why were George Westinghouse archives vetted so carefully (p. 376)? - William Gilbert (for Queen Elizabeth) coined word 'electric' - [the] Greek word for amber is 'electron'. - John Hart's ax murder of his wife, p. 185. - Edison - deaf. - Kinetoscope. - Light bulb controversy; J. P. Morgan's home; Electric chair; The Word's Fair; Niagara." - Notes on half-title page refer to Tesla's polyphase induction motors, Edison's winning a clear-cut patent for the light bulb, the execution by electrocution of William Kemmler, and the accidental death of John Feeks by electrocution. The back endpapers include statistical information on the increased use of electricity in America and list the death dates and the number of patents of George Westinghouse, Thomas Edison, and Nikola Tesla. -- Annotations by Brian Lamb in the margins and underlining of pertinent phrases throughout the book. 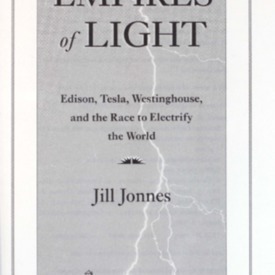 Jonnes, Jill, “Empires of light : Edison, Tesla, Westinghouse, and the race to electrify the world.,” One Book. One Author. One Hour., accessed April 21, 2019, http://booknotes.gmu.edu/items/show/731. "Edison, Thomas A. (Thomas Alva), 1847-1931."